Installing a kitchen outside can enhance your backyard and make it one that you will want to spend 95% of your time in. Here in the Eastern Shore of Maryland and Delaware, being outdoors is one of our favorite pastimes in the summer! Whether you are enjoying a family get together, or cooking regular dinner for your immediate family, something about being outside is satisfying. It is even more satisfying when you have a wonderful place to escape to. One of the most important things to remember when installing an outdoor kitchen is best use of space. What do you want to do with this space? How do you want it to feel? How often will the space be used? Where should the most important thing be placed, and what is it? What is your budget? Is the space covered or not? 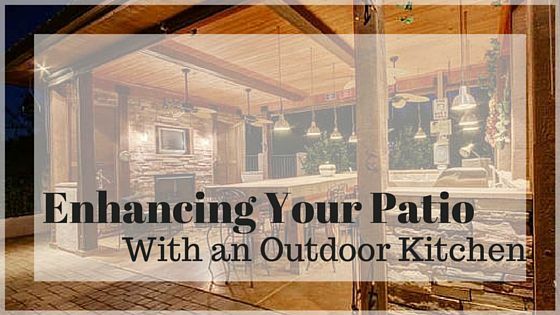 Before you can begin planning the outdoor kitchen, you need to choose a location for it. It is sensible to build the outdoor kitchen close to your indoor one. This makes food transportation easy. If you decide that your outdoor kitchen will be entirely sufficient on its own (appliances, utilities, seating), you can build wherever you want. You should also consider where you can get privacy, with less fire hazards. If you want to feel privacy, and you want the kitchen in a place where there is no privacy, adding bushes to the surrounding patio/deck can be helpful. These include running lines for water, gas, and electricity. If you want your outdoor kitchen to function completely separately from your indoor kitchen, these are all utilities that you will need available outside in order to use the kitchen. You will need a plan for draining water in addition to adding a water line. Another key factor is weather protection. You will want coverage for seating areas, appliances, and countertops. You might want to consider adding a fire pit. In the cool autumn and spring months here in Delmarva, this is a wonderful addition to the chilly nights. Even the hot summer nights a fire can be a refreshing thing. Whether you have a concrete surface, or wood slats, it is always more pleasant to be on a clean new surface. This doesn’t mean you have to replace your existing structure. You may want to re-stain & Reseal your deck, or paint your concrete. Sometimes just running a hose over your patio can help as well! What do you think about outdoor kitchens? Where would you put one of your own? Let us know what you think in the comments below!